Basketball is a fast-paced game with few scheduled breaks in the action, but coaches and players can call a time out to stop the clock and confer as a team. 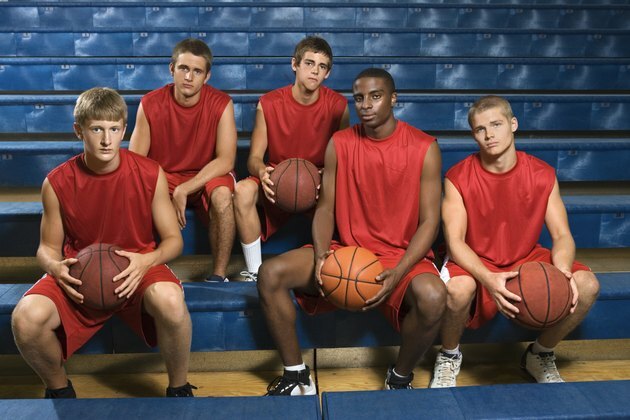 Certain rules in high school basketball govern the number of time outs, how they are called and what teams can and cannot do during the timeout. Understanding these rules will help players and coaches avoid penalties associated with improperly calling time outs. In high school basketball, teams are awarded three 60-second time outs -- also known as "full" time outs -- and two 30-second time outs at the beginning of the game. Teams may use these time outs at any point during the game. For instance, a team may use all its time outs in the first quarter, or save all of its time outs for the last two minutes of the game. If overtime is played, teams are awarded an extra full time out in addition to any time outs left over from regulation play. Not just any player may call time out, and coaches may not call time out at any time during the game. To be able to call time out while the ball is live, a player must be in possession of the basketball. When the ball is live, coaches may only call a time out when their team is in possession of the ball. When the ball is dead, any player or coach may call a time out. If a player or coach calls a time out when a team does not have any left, that team is charged with a technical foul. Teams may make necessary substitutions during time outs. However, players must report to the table 15 seconds before the end of the time out. The official timer is responsible for sounding a warning signal at the 15-second mark before the end of the time out. If any substituting players have not reported to the table by that point, they must wait until the clock starts and stops following the time out to substitute into the game. In certain situations, game officials may call a time out that is not charged to either team. For example, if there is an injured player on the floor, or if there are dangerous playing conditions or a discrepancy in the official score, one or more officials may stop the clock and call an official time out to rectify the situation. A loose ball that causes an unusual delay may be another official reason for a time out. If an official stops play for an injured player, and the coach comes out onto the floor to attend to the player, the coach must call a time out to keep the player in the game. Otherwise, the coach must substitute for that player.